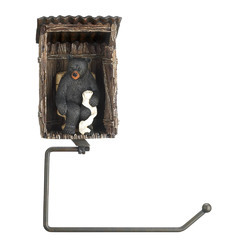 Add a bit of fun to your bathroom with this whimsical toilet paper holder that will delight your visitors. A comical black bear takes a break in his weather-worn outhouse and the paper holder below is made from iron. Item weight: 1 lb. 7 3/8" x 3 3/4" x 9 1/2" high. Polyresin and iron. Toilet paper not included. UPC: 849179019839.